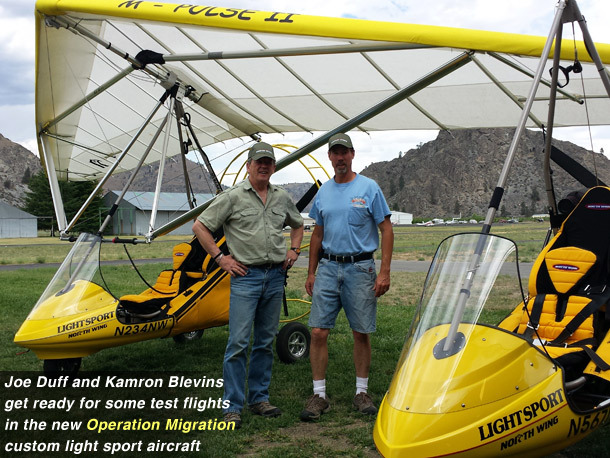 North Wing recently had the fun opportunity to work with the Operation Migration crew to upgrade their fleet of trikes. Flying relatively slow with young Whooping Cranes requires custom trike modifications, including a Propeller Guard and weight-reduction changes to the trike frame. Click here to read Joe Duff's blog where he describes their time at North Wing. Operation Migration has played a lead role in the reintroduction of endangered Whooping cranes into eastern North America since 2001. In the 1940s the species was reduced to just 15 birds. Using ultralight aircraft, Operation Migration pilots act as surrogate parents and guide captive-hatched and imprinted Whooping cranes along a planned migration route beginning in Wisconsin and ending in Florida - as depicted in the Columbia Pictures film Fly Away Home. Operation Migration relies on contributions from individuals and foundations to continue our work. You can help ensure the Whooping crane survives for future generations by calling 800-675-2618, or visiting this link to pledge your support.